It's shocking to see viable pub businesses ending like this. And it's no exaggeration to say that British pubs and our very way of life are under serious threat all over the UK from the actions of pubco's. If YOU care about the Owl and all great community pubs then, please, tell government about your concerns through the Fair Deal For Your Local website - which is backed by CAMRA and the Federation of Small Businesses among many others and get all your friends and family to do the same. Pub companies like Enterprise Inns have been quietly asset stripping Britain's pubs - running them into the ground by charging lessees massively overpriced rent and drinks supply prices - for 25 years. Now their 'tied lease business model' (the maximum extraction of cash with minimal investment possible) is comprehensively failing, more and more pub businesses struggle to meet the unsustainable financial demands the pubco's place on them as they struggle themselves to pay of massive mountains of debt. Tied pubs have been failing in huge numbers - you can see the carnage of closed pubs and inappropriate and just bad conversions of pubs to alternative use - all over the UK to the extent that now 26 pubs are closing, forever, every week. 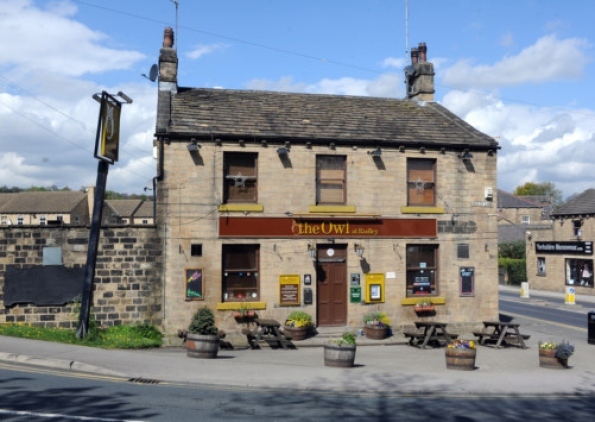 It's got so bad that clearly viable businesses run by publicans who are serving their communities consistently well, such as the Owl at Rodley, are no longer returning the forced Return On Investment the private equity owners demand. So the tenants are forced out and, if no one else can be found to invest further in the premises at their own expense - the pubco flogs off the freehold to put cash into their debt mountain. It's the modern way. Please join Fair Deal For Your Local... and help put an end to this terrible blight on our tradition and cultural heritage. Thanks.